As all of you coffee drinkers know, this season we are proud to announce a special coffee in limited quantities, while supplies last. Jamaica Blue Mountain Peaberry is an illusive and very rare coffee, so potent that we can only unleash it in small batches. 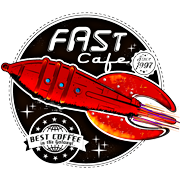 This is the first time we’ve produced a Peaberry at FastCafe.com, which means that Santa has some delicious Coffee this year, and if history is any indicator… it won’t last through Christmas. Jamaica Blue Mountain Peaberry Coffee Beans in 1 lb bags from FastCafe allows you to stock up and save on your favorite whole bean coffee. Jamaica Blue Mountain Peaberry known for a good acidity and a clean cup of coffee from each pot. Grinding your whole bean coffee fresh ensures that you will achieve all of the flavor and aroma. Peaberry, known in Spanish as caracoli, is a type of coffee bean. Normally the fruit (“cherry”) of the coffee plant contains two seeds (“beans”) that develop with flattened facing sides, but sometimes only one of the two seeds is fertilized, and the single seed develops with nothing to flatten it. This oval (or pea-shaped) bean is known as peaberry. Typically around 5% of all coffee beans harvested have experienced this small mutation. Normal coffee beans are less commonly called by contrast flat berry. Posted in Blogs and tagged Blue Mountain Coffee, blue mountain peaberry, jamaica, Jamaica Blue Mountain, Jamaica blue mountain coffee, jamaica coffee, Jamaica peaberry, jamaican blue mountain coffee, jamaican peaberry, Peaberry, peaberry coffee. Older →PRE-ORDER HERE: Adventures of Captain Kimo T-Shirts & Hoodies!